Dr. Nelly Auersperg is recipient of the Terry Fox Award and of the Award for Lifelong Achievment from the Society for in Vitro Biology. It is interesting that in 2003 the BC Women's Hospital & Health Centre founded the Nelly Auersperg for the health of women. In 2007 the Faculty of British Columbia decorated her with the Award for Lifelong Achievement. 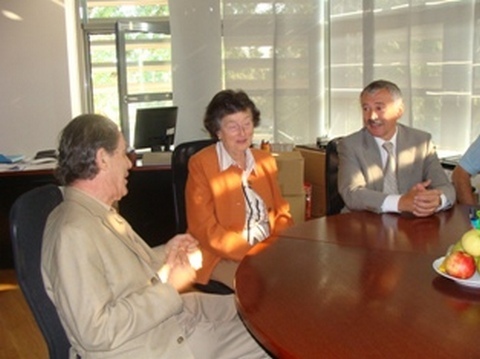 In 2008 she was awarded with the Doctor of Sciences title (honoris causa) by the Rector of Simon Fraser University. 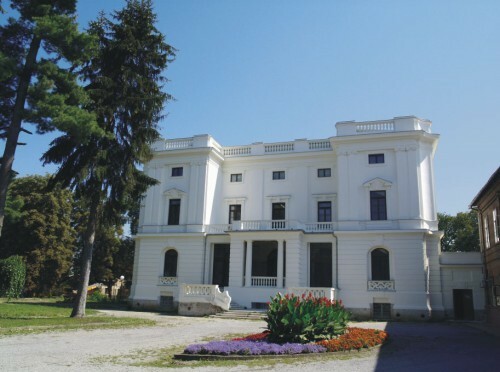 She is in contact with Belišće, which she visited in 2003. Her father, Viktor Gutmann, was important for industrial flourishing of Belišće, which ciesed after the 1945 advent of communist Yugoslav rule. Nelly Auersperg enrolled in medical school in Zagreb (under the name of Nelly Gutmann) in the fall of 1946 and studied for 3 years till 1949, when she left former Yugoslavia for Israel. She came to Canada in 1950.
where she studied for three years till 1949. Mr. Chancellor, Dr. Nelly Auersperg is one of those exceptional individuals who discover their purpose early in life and to the great good fortune of society pursue it with vision and passion. She is one of Canada’s preeminent scientists, a scholar, researcher, and teacher who has made seminal contributions to women’s health and cancer research. Dr. Nelly Auersperg b. Gutmann in Belišće, Croatia, 2003, where she spent her youth. Born in Austria, she escaped to the former Yugoslavia with her family just before the Anschluss. She enrolled in medical school at the University of Zagreb, and subsequently completed her medical training at the University of Washington. As a young medical student, she continually asked the question “why?” and this innate curiosity combined with her sense of wonder about the human body compelled her to undertake research into its mysteries. 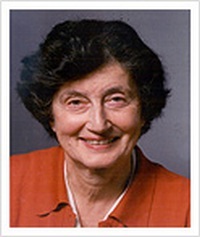 After completing a Ph.D. in cell biology at the University of British Columbia, she assumed a position there as Associate Professor in 1968. Since then Nelly Auersperg’s quest has been truly remarkable. She received her first Canadian Cancer Society research grant in 1974, and today, more than thirty years later, her work is still funded by the society. Her pioneering investigations have greatly advanced knowledge of the development of gynecological cancers. Much of her research has focused on the early detection of ovarian cancer. Most recently, she and her team have made a ground-breaking discovery that may lead to the development of clinical markers for the early detection of (pre)neoplastic lesions in women at high risk of developing ovarian or breast cancer. 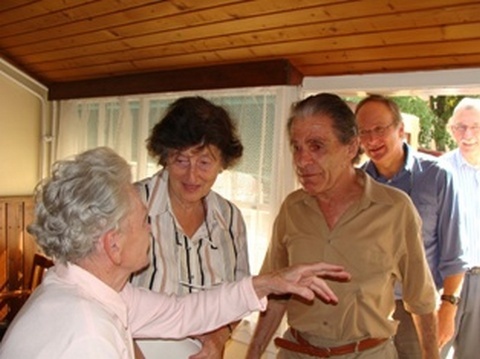 Dr. Nelly Auersperg b. Gutmann in Belišće, Croatia, 2003. On the right to her is Mr. Francis Gutmann, her brother. With that generosity of spirit that is the hallmark of the finest scientists, she has shared her knowledge with peers, students, and community. A prolific author, she has published 177 articles in refereed journals and authored eleven book chapters. She has also mentored more than sixty graduate and post-graduate students, many of whom are now conducting critical research of their own. She has received many honours for her exceptional contributions, including the Terry Fox Award and the Distinguished Lifetime Achievement Award from the Society for In Vitro Biology. 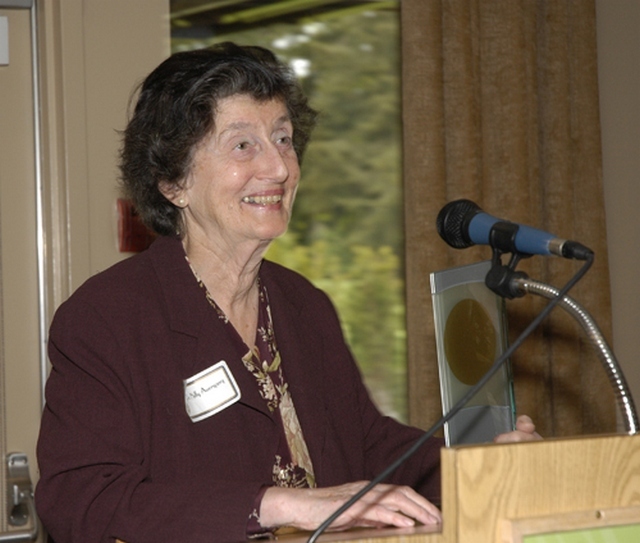 In 2003 Women’s Hospital & Health Centre established the Nelly Auersperg Award in Women’s Health Research, and in 2007, the University of British Columbia recognized her with its Faculty of Medicine’s Lifetime Achievement Award. Mr. Chancellor, on behalf of the Senate of this university, I ask that you now confer upon Dr. Nelly Auersperg the degree Doctor of Science, honoris causa. UBC professor and Terry Fox Research Scientist An honorary doctor of science was conferred on Dr. Nelly Auersperg during the Faculty of Science Ceremony on Wednesday, June 4, 2008. The following is Dr. Auersperg’s convocation address. I am delighted to be here, and very grateful to Simon Fraser University for the great honor of awarding me the honoris causae degree. I am also extremely happy for this opportunity to meet, even from a distance, all of you, because we have something important in common: we have all chosen science as a career. As you well know, there are many different kinds of science and dozens of career choices within each one of these; but I think that there is something that unites us: a sense of curiosity, a drive to understand why things are and work the way they do, and, hopefully, a desire to use this knowledge for constructive purposes. So, I want to congratulate you on your career choice but remember that I am totally, completely biased. I have spent much of my life doing biomedical research and teaching students at UBC. My professional life has been wonderful and so exciting that I am having a very hard time to quit, though I am supposed to because I am old. You may not realize it, and some of you may not like the idea, but the university degree that you will receive today will raise you to a higher level within society. It will enable you to get better jobs, higher salaries, more career choices and more interesting work. Furthermore, your university background will make you more knowledgeable and interesting people. But as you well know, new privileges come with new responsibilities. I have always felt that I had no business taking advantage of my education and the resulting opportunities without giving something back to the society that made it all possible – because don’t forget, in many parts of the world, you would never be able to achieve what you achieved today, for many reasons – political, social, cultural , whatever. So, I want to end with two wishes: First, I hope that your careers will be your hobbies. They should be fun and exciting and not just a means to make a living. And it is entirely up to you and your attitudes to achieve this - any area of science offers lots of opportunities for enjoyable careers. Secondly, I hope that you will use your knowledge to try to make this a better world; through service, new discoveries, better communication, teaching, money -whatever – the opportunities are endless. And don’t ever think that you, alone, cannot make a difference. Very few people in history have made a major impact singlehandedly. But if all of us contribute in a small way, together we can make this a better world. Dr. Nelly Auersperg is one of Canada’s foremost cell biologists. She is an international leader in the establishment of laboratory techniques for the study of ovarian cancer. The Nelly Auersperg Award in Women’s Health Research is granted to a promising researcher in the area of women’s health to conduct an innovative research project. The Award was established in 2000 by donors who have known Nelly for many years and admire her lifelong devotion and commitment to women’s health research and her contribution to medical science. Nelly’s work inspired their lead donation for this Award. They, in turn, hope their donation will inspire future researchers to follow in the path of Nelly's tireless work. Additionally, new donors can take pride, knowing that their gifts will also inspire, celebrate and ultimately bring greater knowledge to women's health. The Nelly Auersperg Award supports pilot studies in women’s health which aim to generate preliminary data, test new approaches, methodologies or tools. The funding supports activities that will enable the pursuit of more ambitious studies and foster further funding applications. The amount awarded for this one-year grant is $10,000-$15,000. The Catalyst Grants are intended to support researchers in British Columbia engaged in research relevant to women’s health. Principal Applicants must be an independent researcher/ clinician (includes midwives, nurses, social workers and physicians) and /or must have completed a post-graduate degree (Masters, PhD or MD) and cannot be enrolled as a student in a degree or diploma program, or be employed as postdoctoral or clinical fellows. The funding period is 12 months. Grant recipients are required to acknowledge the Nelly Auersperg Award in any communication or publication related to the project. Grant recipients are required to provide an academic report and a lay summary of their research project at the completion of the funding. An independent peer review committee will evaluate the full applications. 5. Information on host institution: The host institution is most commonly a publicly-funded BC health research institution or university, responsible for administering award funds. 1) Lay summary with title – separate page – maximum length of 250 words. Nelly Auersperg's father was Viktor Gutmann, the youngest son of the youngest son (Aladar) of S.H. Gutmann who created the industry in Belišće in the 19th century. Her father was one of the directors who ran the company. Their family was in Belišće when the Nazis came in 1941. After surviving WWll by a miracle (they were Jewish) her father was arrested by the communists in 1945 as a ‘capitalist and aristocrat (he was a baron)’ and as colaborator with the Nazis (which was completely untrue) and he was executed in 1946. Vikor Gutmann je bio najmlađi sin od Aladara (koji je bio najmlađi sin od S.H. Gutmanna) i Aladarove supruge, Ottilie Pollak'Rudin. Viktor je bio rođen 3. oktobra 1891, a umro je 17. februara 1946. On je proveo sav svoj život u Belišću i u Beču. On je studirao za strojarskog injenjera u Beču. Odmah nakon što je dobio diplomu, on se je priključio austrougarskoj armiji i borio se je na ruskom frontu za vrijeme prvog svjetskog rata, gdje je dobio nekolilo medalja za hrabrost. Nakon konca rata, on se je priključio upravi od S.H. Gutmann d.d. u Belišću, gdje je ostao dok industriju nije preuzela N.D.H. u 1941. Na početku je radio pod upravom Artura Gutmanna koji je bio sin od Edmunda i najstariji među rođacima, i koji je vodio firmu. Nakon smrti Artura, Viktor i njegov brat Erno (Ernest) su bili jedini članovi obitelje Gutmann koji su još živili u Belišću i dalje su upravljali kao direktori od S.H.Gutmann d.d. Oni, zajedno sa drugim članovima uprave, su bili odgovorni za uspjeh i povećanje industrije, i od Belišća kao zajednice, između prvog i drugog svjetskog rata. Bilo je poznato da su Viktor i njegova žena, Luise, imali odlični odnos sa Belišćanima. Mi se sjećamo, kao djeca, da nismo mnogo vidjeli našeg oca. Naša majka je bila Bečanka i volila je biti u Beču, gdje smo imali stan. Ali naš otac obično nije bio s nama jer je imao previše posla u Belišću. A kada smo svi bili u Belišću, on bi se vratio iz ureda kasno, nakon što smo mi već večerali. Među našim najljepšim usmomenama s njime su praznici sa skijanjem i ići u operu u Beču. Mi se isto sjećamo da kada smo bili u zatvoru u Savskoj Cesti u Zagrebu u 1943, on nas je podučavao matematiku, geografiju i povijest. Na koncu drugog svjetskog rata, granice su na početku bile još otvorene i bilo je relativno jednostavno otići u zapadnu Europu. Protiv želje njegove žene koja je htjela da napusti Jugoslaviju on, idealista, je htjeo ostati u Belišću da pomogne u rekonstrukciji zemlje. Za nagradu za njegovu lojalnost, bio je streljan u 1946. I express my deep gratitude to Dr. Nelly Auersperg for sending me these lines in January 2011. BELIŠĆE - Belišćani kažu da je ovog Božića njihov grad najljepši ukras dobio završetkom višegodišnje obnove eksterijera Palače ili Paleja Gutmann. Na žalost, unatoč dosad uloženih 11 milijuna kuna u ovaj spomenik kulture, za što su najzaslužniji Osječko-baranjska županija i država preko svojih ministarstava, te Grad Belišće i Belišće d.d., struka kaže da će bar još nekoliko milijuna biti potrebno da bi se u sljedećih nekoliko godina obnovila njezina unutrašnjost! obnavalja se od teškog razaranja tijekom srpske agresije na Hrvatsku. Podsjetimo, Palača Gutmann objekt je pod zaštitom Ministarstva kulture kao spomenik kulture A-kategorije. Palej je 1905. godine sagradio barun Edmund Gutmann kako bi sina Artura i njegovu suprugu, barunicu Stefaniju, privukao u Belišće, no u tomu nije uspio. Barunica je radije boravila u Beču, Parizu i drugim svjetskim metropolama, ali je zato Belišće dobilo svoje najvrjednije zdanje. Tijekom Domovinskog rata, točnije 3. siječnja 1992., u topničkom napadu na Belišće zgrada je pogođena zapaljivim projektilima i gotovo je u cijelosti uništena njezina unutrašnjost. Ostali su samo zidovi pa je odmah počelo konzerviranje objekta i sprječavanje daljnjih devastacija. Temeljita obnova zgrade počela je u rujnu 2005. godine, kada su osigurana dodatna sredstva Ministarstva mora, turizma, prometa i razvitka i Osječko-baranjske županije, no veliki teret u obnovi podnijeli su i Grad Belišće te tvrtka Belišće d.d., čiji građevinski inženjer Zvonko Dragila i koordinira obnovom Paleja. Najveći dio poslova na unutarnjem uređenju Paleja izvodi Izolirka d.o.o. Osijek, međutim, angažirani su i drugi izvođači za pojedine specifične poslove. Tako su već uvedene električne, vodovodne, toplinske, telefonske i informatičke instalacije, što su gotovo rutinski poslovi u odnosu na stolarsko uređenje hola i izradu vitraja na stropu Paleja, što je zahtijevalo posebne stručnjake. Zanimljivo je naglasiti da će uz Osječko-baranjsku županiju, koja je ove godine u svom proračunu predvidjela 1,200.000 kuna za nastavak obnove Paleja, u obnovi sudjelovati i nasljednica obitelji Gutmann, Nelly Auersperg, koja je prije nekoliko godina posjetila Belišće i najavila da će s 10.000 eura vlastitih sredstava poduprijeti nastavak obnove, potvrdio je gradonačelnik Belišća Zvonko Borić. Borić je također kazao kako je do početka obnove Palej bio u 100-postotnom vlasništvu Belišća d.d., međutim početkom obnove 50 posto vlasništva objekta prešlo je u ruke Grada Belišća. about dr. Nelly Auersperg during my stay there in May 2010.